Malva Veticellata, Ginseng, Natural Herbs. Contains no caffine. It is soothing and relaxing. Brew one tea bag in one cup of boiling water for 2-3 minutes. First time users, do not brew the tea too strong. Tea can be served either hot or chilled. 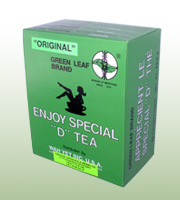 You may experience extra bowel movement after drinking the tea 8-10 hours. Not recommended for pregnant women and children under 12. This product contains malva veticellata. Do not use if you have or develop diarrhea, loose stools or abdominal pain because it may worsen these conditions and be harmful to your health. Consult your physician if you have frequent diarrhea or if you are pregnant, nursing. Taking medication or have a medical condition. Wah Yet Group Inc. U.S.A.